We cordially invite you to Experientia’s inaugural “Talking Design” evening. 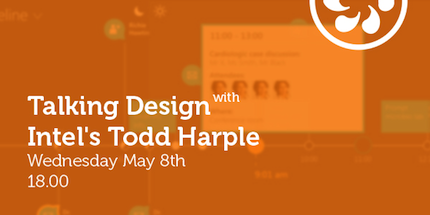 On Wednesday May 8th, at 18.00, we are excited to have Intel’s Todd Harple speaking at the Experientia offices, followed by a light aperitivo. The “Talking Design” guest speaker evenings are part of our drive to bring the design world to Turin, by hosting a series of talks from global experts in the industry, to share their experiences and knowledge with the staff and friends of Experientia. Todd Harple is an Experience Engineer and Strategist at Intel Corporation, and is currently on sabbatical at the International Training Centre of the ILO in Turin. He will talk about his experiences in mobile-related research all over the world. Todd Harple is an expert anthropologist and ethnographer, with global experience in developing and driving actionable results from ethnographic and context-based research. His work leverages ethnographic and design research techniques to uncover innovative solutions to real-world problems and to identify new market opportunities. Prior to joining Intel, Todd was a social and cultural consultant with work experience in the financial services and natural resource industries as well as in museums, community development and teaching. Todd earned a PhD in cultural anthropology from The Australian National University in 2001.